It's not too late to register for the TSU Summer Camp Job Fair! Looking for the best? Hire a Tarleton Texan! 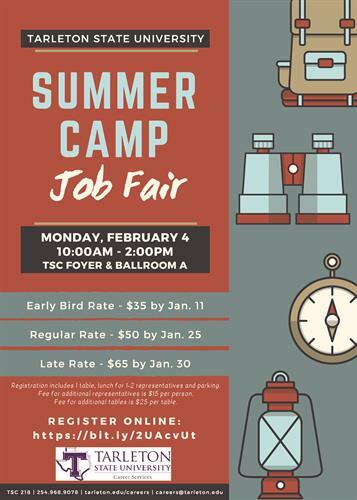 Tarleton’s Career Services Center's annual Summer Camp Job Fair will allow students the opportunity to meet with summer camps that are currently hiring. Registration includes 1 table, lunch for 1-2 representatives and parking. Fee for additional representatives is $15 per person. Fee for additional tables is $25 per table.